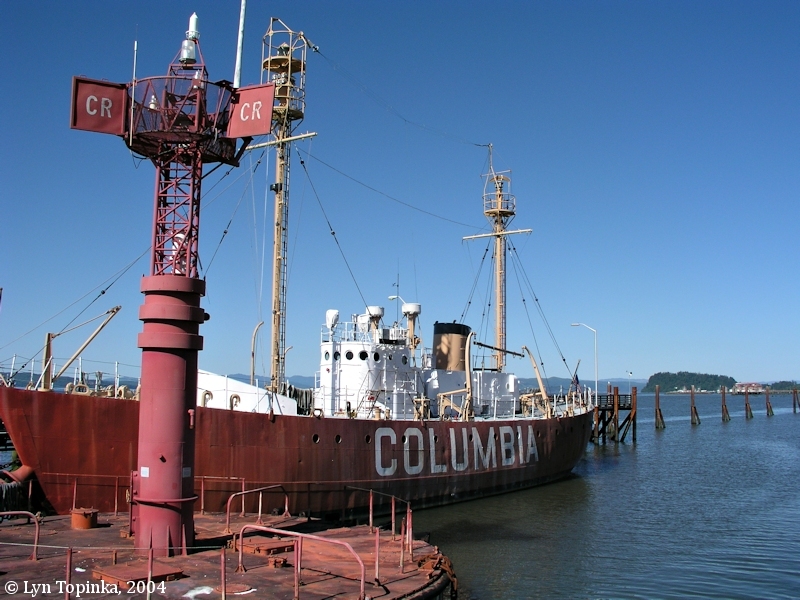 The Columbia River Maritime Museum in Astoria, Oregon is home of the last lightship serving the Pacific Coast, the "Lightship Columbia". Officially known as "WAL-604" (later "WLV-604"), the 128-foot welded-steel lightship was built in 1950 for the U.S. Coast Guard, and was stationed at the mouth of the Columbia River near Cape Disappointment between 1951 and 1979. Columbia Lightship "WAL-604" retired on December 13, 1979, after 28 years of service, and was replaced by a 40-foot-diameter and 42-foot-high navigation buoy. Lightship Columbia "WAL-604" was sold to the Maritime Museum in Astoria in 1980, replacing its previous exhibit "Columbia Lightship 88" (see more below). Lightship "WAL-604" displays the name Columbia, is afloat, open to the public, and capable of operating under its own power. On December 20, 1989, the "Lightship Columbia" was added to the National Register of Historic Places as a National Historic Landmark #89002463. 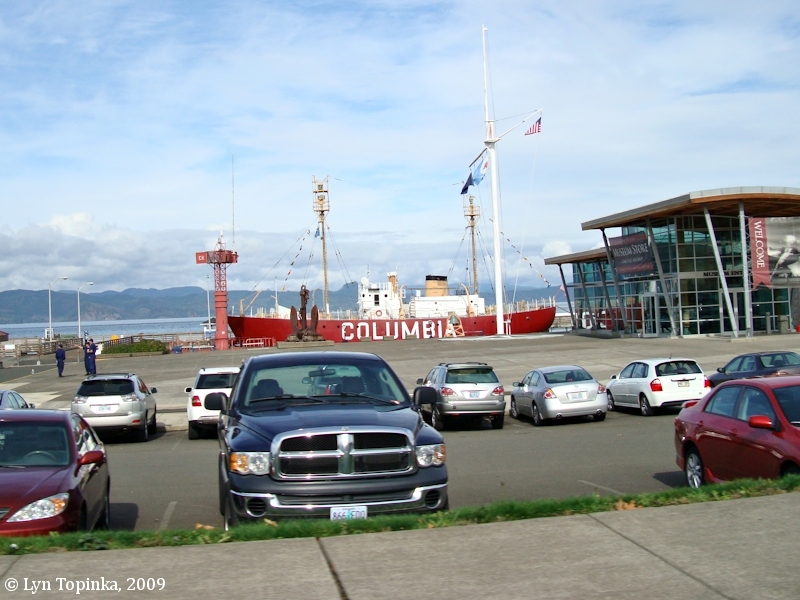 The "Lightship Columbia" can be seen at the docks of Astoria's Columbia River Maritime Museum, with views of Tongue Point upstream, and the Astoria-Megler Bridge downstream. 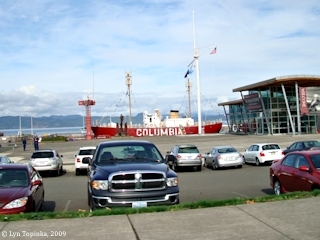 Click image to enlarge Columbia River Maritime Museum, with Lightship Columbia, Astoria, Oregon. View seen and image taken from moving car. Image taken October 18, 2009. "... Two masts, schooner-rigged, no bowspirt; red, circular, iron, cagework daymark at each masthead; hull red, with "COLUMBIA RIVER" in black on each side and "No.50" in black on each quarter." 1909 to 1939 ... "LV-88": In 1909 a steel-hulled ship driven by a steam-powered propeller, the "LV-88", replaced the wooden lightship. Throughout its career it was upgraded with electric lights and a diesel elecric engine. In 1978 the "LV-88" was listed on the National Register of Historic Places Structure #78002282. "... Columbia River Lightship is moored on the Main Channel range for entering Columbia River, and is 8.2 miles 213o from North Head Light. It has a red hull with COLUMBIA on each side and two masts. The light, shown from the foremast, is 67 feet above the water, and visible 14 miles. The fog signal is sounded on a steam diaphragm horn. The lightship has a radiobeacon equipped for distance findings; the station receives and transmits emergency radio messages. Storm warnings are displayed at the lightship during daylight hours. ..."
1951 to 1979 ... "WAL-604": The last lightship serving the Pacific Coast was the "Lightship Columbia", officially known as "WAL-604" (later "WLV-604"). This vessel is a 128-foot welded-steel lightship built in 1950 for the U.S. Coast Guard. It was stationed at the mouth of the Columbia River between 1951 and 1979. Columbia Lightship "WAL-604" retired on December 13, 1979, after 28 years of service, and was replaced by a 40-foot-diameter and 42-foot-high navigation buoy. On December 20, 1989, the "Lightship Columbia" was added to the Register of Historic Places as a National Historic Landmark #89002463. The Coast Guard built six lightships. The first two, WAL- (later WLV-) 189 and 196, were built at Bay City, Michigan, in 1946. Somewhat similar in appearance to the 1930s lightships, the Coast Guard lightships, WLV-189 and 196, as well as the four lightships that followed them were the only completely welded lightships, built with a high degree of structural integrity and transverse bulkheads. These vessels were also the only lightships built with alternating current electrical systems throughout. They were direct diesel propelled, reflecting improvements made in high-compression diesel engines since the 1930s. In 1950, two additional lightships, built to the same general plan of 189 and 196, and with the same features, were launched from the Rice Brothers shipyard at East Boothbay, Maine. WAL-604 and 605 were the last lightships built under contract for the government. In the same year, the Coast Guard built at its Curtis Bay, Maryland, yard Lightship WAL-612, another sister ship to 189 and 196. The last lightship was also built at Curtis Bay. Constructed in 1952, WAL-613, like her five preceding sisters, was a 128-foot welded steel vessel. However, the lightship mounted a single tripod mast of British design with the light on top. The Coast Guard-built lightships were the last in service, as all others were gradually retired. Technology brought an end to manned lightships about the same time manned lighthouses were being considered for automation. Large navigational buoys, 40 feet in diameter and 42 feet high, painted lightship red with automatic lights, fog signals, and radio beacons began to replace lightships in 1967. In 1983 the last two lightships, marking the Nantucket station, retired, ending a 150-year lightship tradition in the United States. ..."
Today, 22 lightships exist in various conditions in the United States, with the earliest survivor from 1902. All six of the Coast Guard-built lightships survive." Source: U.S. National Park Service Marine Heritage Program website, 2005. The Columbia River has "Colossal Claude", it's very own version of Scotland's "Loch Ness Monster". The following history of Claude was obtained (2011, 2017) from "Strangeunknown.com", "Cryptozoo-oscity.blogspot.com", and "OregonLive.com". "... about 40 feet long. It had a neck some eight feet long, a big round body, a mean looking tail and an evil, snaky look to its head." News reports at the time say the crew studied the animal for a while through field glasses with some men wanting to investigate further by taking out a lifeboat and pursuing it. The officers of the LV-88 however turned down their request, worried that the animal might swamp the boat or attack them. "... long, hairy, tan colored creature, with the head of an overgrown horse, about 40 feet long, and with a 4-foot waist measure." Claude was again seen in 1937 near Yachats, about 150 miles south of the Columbia River. In in 1939 the crew of a halibut fishing ship, The Argo, "came face-to-face with a creature near the mouth of the river. The creature reared up over 10-feet out of the water and was said to looked directly at the crew." Sightings continued until the 1950s, then they appear to have stopped. Then, in 1963, Shell Oil Company explorers on an oil-drilling expedition off the Oregon Coast supposedly filmed the creature swimming in 180 feet of water. The Columbia River Maritime Museum was founded in 1962 by Rolf Klep, a native of Astoria who retired back to his home town. Kelp was a long-time collector of marine treasures, and with a group of his collegues wanted to establish a museum to preserve the maritime heritage of the Columbia River region. 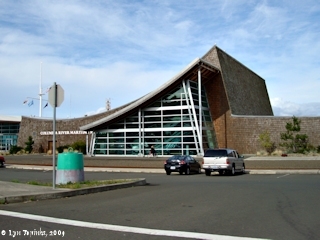 The Columbia River Maritime Museum is the result. The museum is located along Astoria's historic waterfront and displays one of the most extensive collections of nautical artifacts on the west coast. 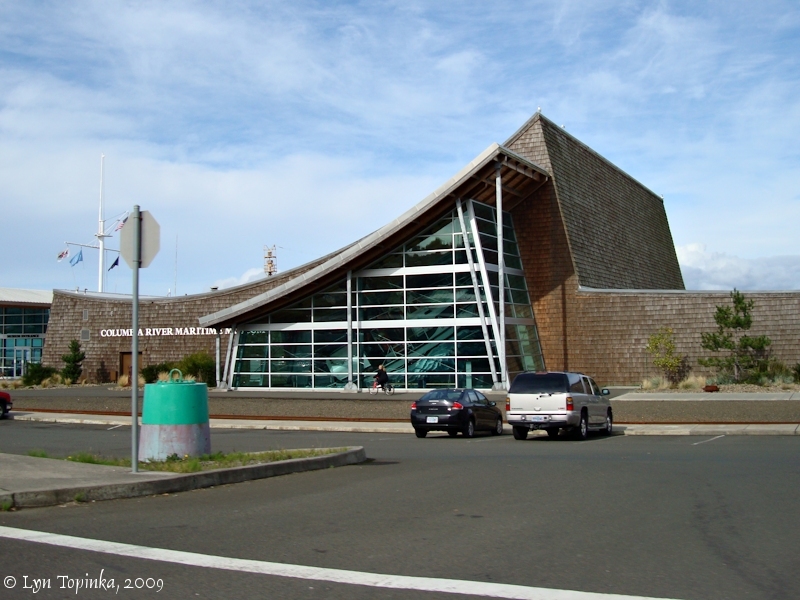 It is 44,200 square feet of exhibit space, was designated Oregon's official state maritime museum, and was the first nationally accredited maritime museum in the western United States. It is the home of the "Lightship Columbia". Click image to enlarge Columbia River Maritime Museum, Astoria, Oregon. View seen and image taken from moving car. Image taken October 18, 2009.